Recently we had a major problem with the engine and just has been solve. We couldn’t leave Nanaimo until last thursday as we had a reoccurring overheating problem. Now as readers might recall the heat exchanger had broken last Thursday when we arrived at Ladysmith. After remanufacturing a piece for $3 and buying a Volvo washer for $5 we thought we had fixed it. It ran fine back down to Nanaimo and we got hauled late Saturday afternoon as the yard was behind. Unfortunately we where forced to stay on the hard at Stones boat yard as the caulking around the new transducer had to set. The Yard did not work on a Sunday so we had to wait until Monday. After we stayed two nights on the hard we finally get down in water again. After enlacing new depth sound transducer and cleaned the hull. So it was Monday and we had to do some series shopping. A Brother of a NCSA member (that is a challenge to figure out what that stands for) PRIZE FOR THE FIRST CORRECT GUESS. helped greatly by lending us his vehicle. Cheers Peter! So after buying Luksana a colour coordinated Ocean going self inflating, safety harnessed life vest and a few other things we decided to flee the big city before Visa figured out we are broke. Monday 12 May 2014 Sunshine and warm Clean the hull. Let Beautiful Swimmer in water early morning at 7.30 a.m. and we in Newcastle Island Harbour with the plan to Ladysmith next day. Tuesday 13 May 2014 Sunshine and warm It should be a beautiful day for travel with nice sunshine until something unexpected happened. 09.30 a.m. Leave Newcastle Island harbour and head to Strait of Georgia with the idea to run water maker. 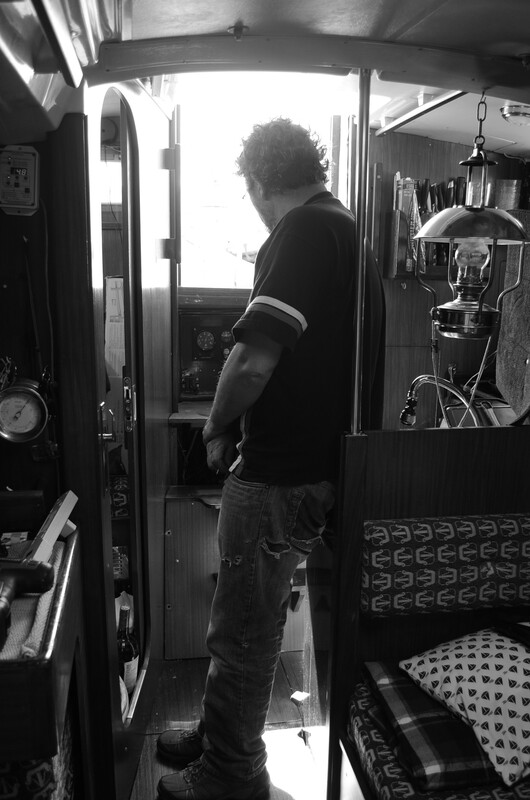 Then… Stephen noticed that water heated to high 180 F so we cannot continue to Ladysmith today and sailed with low engine back to icon-anchor at the same area to find out what cause the problem. Fix the water leaking and start the engine to check the water temperature. Well I changed the impeller as it was about to fall apart and I had a spare. Could not find an obvious reason for the overheating. Started to have my doubts about letting Oliver help fix my heat exchanger!!!! Wednesday 14 May 2014 With hope that the engine should be good for today after Stephen tried to do something with it a whole yesterday. We leave the harbour at 09.10 a.m. and after a while engine still water heated to high 180 F then we came back to icon-anchor at the same area. Go to the Marine supply shop to get a small piece washer for $55 The guy checked on the computer and then phoned Volvo. No joke they wanted $55 for a plastic “O” ring. Anyway the guy informed Volvo that the customer told them what they could do with their “O” ring, without me saying a word. That is what you call customer service. Thursday 15 May 2014 We don’t want to be here too long whereas the problem with engine will keep watching it on the way until we can docked in Ladysmith, We certain will turn engine on and off to let it cool down. Motoring and luckily with wind from the North east carry us until before at Dodd Narrows. Then at the open seas we check how the engine works again for more safely. On and off engine until we get to Ladysmith Maritime Society. Friday 16 May 2014 The engine fixed. Oliver, old friend with Stephen came to join help all day. The Volvo heat exchanger is a silly contraption. Like much about Volvo marine products it is over complicated and aimed at making Volvo money. The problem is that the front and back plates have to be precisely alined to work properly. Nothing in the manual and nothing on the net. Bugger the idiot who thought this one out. Also today we had replace a new furling line as it cause a problem for headsail couldn’t fold it right away while we were in Johnstone Strait. So we now have a small one again, the larger one was easier to haul on but bound up as the furling drum struggled with the bulk of the thicker cord. Surprised that she did not mention us being in the middle of the NYC Wednesday yacht club race again but I am sure they will appear soon. Cheers!